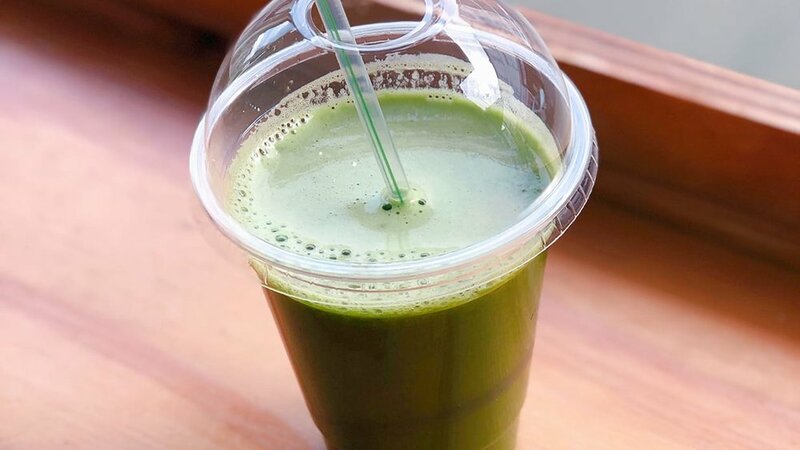 Wild Thyme Wholefoods and Strong Living PT go together as naturally as spinach and kale — that’s why the Wild Thyme team are going to start offering Strong Living members free superfoods in their smoothies! Plus, I’m going to start writing up more blogs and social posts focused on building a stronger relationship between your nutrition and exercise. With the announcement of this exciting partnership, I thought it timely to throw down some insights into the science behind why smoothies are an empowering part of any active healthy lifestyle. Before we get to that, let me introduce you to Wild Thyme. The team heading this joint ownership cooperative is full of energy. Every single one of them has a strong passion to follow and promote healthy lifestyles of all forms, and each member of the crew has their own input into the company. Everything at Wild Thyme is vegan, and almost 100% of the products and recipes throughout the store are organic. They maintain a prevalent belief in environmental friendliness, with a glass bottles-only policy and a self-service recycling system. Naturally, I share the same passions through Strong Living PT, so the collaboration was inevitable! While discussing various ways we can work together, the Wild Thyme crew served up some new smoothie recipes, perfect for boosting fitness and complementing exercise. First up was my favourite: Strawberry Dream. punchy and full of flavour. contains: banana, strawberry, kiwi, fresh apple juice, and mint. The fruit in this smoothie sparks a burst of energy from fructose, making it a perfect shake to drink before exercise. Pre-exercise shakes or snacks give us sugars to fire us up for workouts, supporting the organs and cells you stress during each set. STRAWBERRIES have one of the highest levels of Vitamin C out there, and are a great source of antitoxin phytochemicals. Strawberries support the immune system when the body is going through any change, especially while increasing intensity in physical training. BANANAS are high in potassium and contain magnesium. Potassium is a crucial component of protein synthesis. Muscle growth and repair requires potassium, which, when in training (especially hypertrophy training), helps to increase rate of recovery and muscle mass. Magnesium plays a number of roles in the body, including those involved in the synthesis of fat, protein, and nucleic acids, neurological activity, muscular contraction and relaxation, cardiac activity, and bone metabolism. Even more important is magnesium's pivotal role in both anaerobic and aerobic energy production, particularly in the metabolism of adenosine triphosphate (ATP), the ‘energy currency’ of the body that enables the muscle to have quick access to readily-available energy. KIWI FRUITS are loaded with energy, nutrients, and vitamins, and are low in calories and rich in dietary fibres. Kiwis are known to fight against a range of pathogens and strengthen the immune system. Kiwi contributes favourably to the regulation of the innate and adaptive immune system, which is very critical for the healthy functioning of the body, especially when exercising regularly. Wild Thyme recommend treating yourself to a Strawberry Dream shake around 30 to 45 minutes before a workout. Up next: the Vital Green Juice. Kale, spinach, wheatgrass, spirulina, apple, mint, pineapple, and lemon. Full of strong immunity-boosting greens. The stresses of new exercise regimes or training progressions can be eased with EnergiRevive superfood. EnergiRevive restores energy, strengthens immunity, and helps support the endocrine system (a hormone-driven chemical messenger system feeding through your body) — in particular, the adrenal glands. EnergiRevive has the added bonus of vitamins B6 and B12. B6 plays a key role in the formation of red and white blood cells, supporting the immune system, and B12 works alongside B6 to aid in the production of red blood cells carrying oxygen around the body. You simply can’t go wrong with the benefits this juice can offer! When taking up any form of fitness training, it’s important to ensure the immune system will be supported. Fitness is a huge stress in the body, and nutrition needs to be carefully considered to balance the demands of the body. KALE is a strong source of protein and calcium — two nutrients also necessary for optimal health. The leafy green has more than four times the amount of Vitamin C as spinach, and significantly more Vitamin A, the nutrient necessary for eye and skin health. One serving of kale contains an impressive 907% of your recommended daily amount of Vitamin K, a nutrient vital for bone protection an essential aid in weight-bearing training. SPINACH is one of the best sources of dietary potassium and magnesium, two very important electrolytes necessary for maintaining human health as previously mentioned. This leafy vegetable is rich in water-soluble vitamins, fat-soluble vitamins, and minerals. APPLES deliver an antioxidant called quercetin. This antioxidant aids aerobic endurance by making oxygen more available to the lungs. Perfect for ongoing use, and ideal prior to endurance workouts such as running and cycling. PINEAPPLE is loaded with Vitamin C and A, fibre, potassium, calcium, and phosphorous. It prevents you from free radical damage. Exercise creates free radicals — toxic byproducts of oxygen metabolism. They damage cells and cause oxidative stress. LEMON contributes a small percentage of thiamine, riboflavin, folate, and B-6 to the body. B vitamins are essential vitamins that must be provided by dietary means. These micronutrients are necessary during the body’s process for converting proteins and sugars into energy — essential whilst taking part in a training programme, and during the production and repair of cells including red blood cells. Finally, I tried the Nut Bustah. Perfect post-exercise pickup. Peanut butter, hemp protein, wheatgrass, coconut milk, maca, chia seeds. This tall glass of perfection is packed with amino and fatty acids, making it an ideal post-workout drink. At the core of the Nut Bustah are two tablespoons of peanut butter, containing 188 calories, eight grams of protein, six grams of carbs, and 16 grams of fat. PEANUT BUTTER contains folate, Vitamin E, and magnesium. Magnesium sparks many biochemical reactions in the body, including protein synthesis, muscle and nerve function, blood glucose control, and blood pressure regulation. All of which need more attention when the body has been put through the stress of exercising. That’s why peanut butter is incredible after workouts: it works with other protein sources to achieve the full amino acid chain. HEMP POWDER! Hempseed is an excellent source of protein because it contains all the 21 amino acids. This includes the nine essential amino acids that the body can’t produce on its own, and must take from dietary sources. 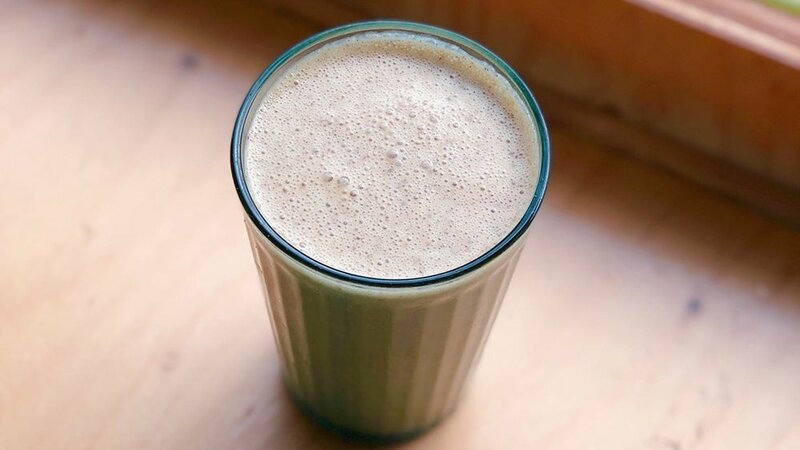 Two tablespoons of hemp protein powder can provide around 13 to 15 grams of protein. Those two tablespoons contain what are called branched-chain amino acids (BCAA). BCAA are the fuel that muscles burn for energy. To serve this purpose, their metabolism is more direct, and undergoes less processing by the liver, unlike other types of proteins. COCONUT MILK is rich in vitamins and minerals: Vitamins C, E, and many Bs are abundant in coconut milk. Vitamins C and E help to boost the immune system, and B vitamins are responsible for providing energy to the cells. Coconut milk is also rich in magnesium, potassium, phosphorous, and iron. Magnesium is responsible for many biochemical functions in the body, including regulating the heart’s rhythm, metabolizing energy, and supporting the function of nerve cells. These two responses are essential in sustaining a healthy and progressive fitness plan. MACA POWDER has more than earned its reputation for boosting energy levels, improving stamina, promoting a clear mental focus, and restoring optimum hormone balance. Maca root boosts levels of antioxidants like glutathione and superoxide dismutase in the body. All without giving you the ‘jitters’, like high levels of caffeine can! Then come the CHIA SEEDS. They’re rich in fiber, omega-3 fats, protein, vitamins, and minerals. A study published in the Journal of Strength and Conditioning concluded that consuming chia seeds enhanced exercise performance for workouts that lasted 90 minutes, the same way a sugar-laden sports drink would, but without all the unhealthy sugars. Chia seeds are also one of the top plant-based sources of protein. This is another reason these super-seeds are awesome to consume for those trying to put on lean muscle, burn fat, and balance blood sugar levels. Strong Living Personal Training are working closely with Wild Thyme to continue to help educate and promote a healthy relationship between exercise and nutrition — and we’re starting by recommending these smoothies as part of your training day regimes. Down a Strawberry Dream 30 to 45 minutes before training, enjoy a Nut Bustah after your workouts, and make the Vital Green Juice a part of your everyday nutrition. 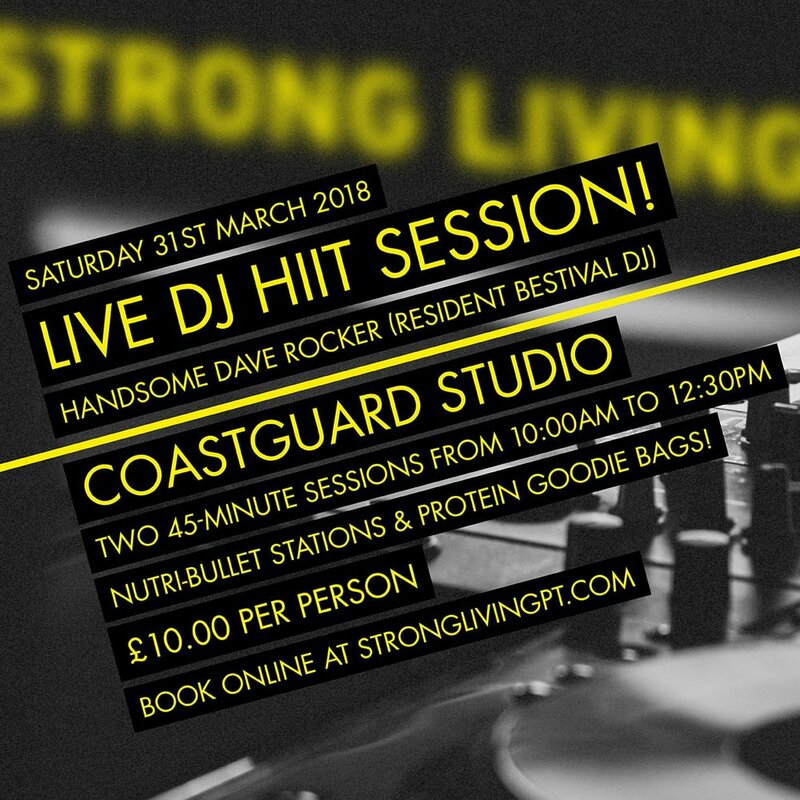 Our first on-location collab with Wild Thyme will be at our LIVE DJ HIIT SESSION event at Coastguard Studio on Saturday 31st March 2018! There’ll be Nutri-Bullet stations and post-workout snacks, and resident Bestival DJ Handsome Dave Rocker is spinning the music. See you there! Keep up with Wild Thyme Wholefoods on their Facebook page and Instagram stream.